Partway through making this comic the source .svg had some kind of aneurysm, spawning over a hundred lines of complete garbage in the middle of a gradient definition. I would describe this as fairly weird. Also, it has become clear to me that this comic requires additional pylons catgirls. @Guest: I do write stories that aren't about D&D. This storyline that's happening right now, for example. And this particular comic isn't breaking the fourth wall. One can clearly see the wall there, and it does not become at all damaged during this comic. In fact, the fourth wall depicted there hasn't been broken since the very first comic. Also stop getting so worked up about this. It's just a webcomic; you should really just relax. I swear I didn't knock the fourth wall off its pedestal. It was like that when I found it. I think I've seen it before though, but only briefly. Already in comic 1 it was badly dented, and it didn't have time to recover before comic 5 hit it. I assumed it had been obliterated completely, but I suppose the Cerebus Syndrome since then has allowed it to regenerate a little. Edit: Are you, by any chance, contemplating an alternate universe which does have a fourth wall? This comic even has a fourth wall?! 1. The art style is deliberately based off of the art of OotS. Rich Burlew gets the same sort of thing said about the syle to him often enough for it show up on the FAQ, and he explained very clearly that he can draw better, but chooses to use that style because it works for the comic better than a more realistic one. 2. There hasn't been a D&D joke or reference in what, hundreds of pages? 3. Copy pasting and adjusting is basically what one dies with this sort of art. Stopping doing it completely would require redrawing all the parts of a character every panel very precisely when, in vector graphics, that would require such ridiculous precision that it would take hours to get it right on just one person. 4. The fourth wall breakage is deliberate and an essential part of humour. That's like asking Rick Griffin to stop featuring animals in his comic. I'm not saying that the comic is perfect, but you seem to be missing some essential things about the comic. 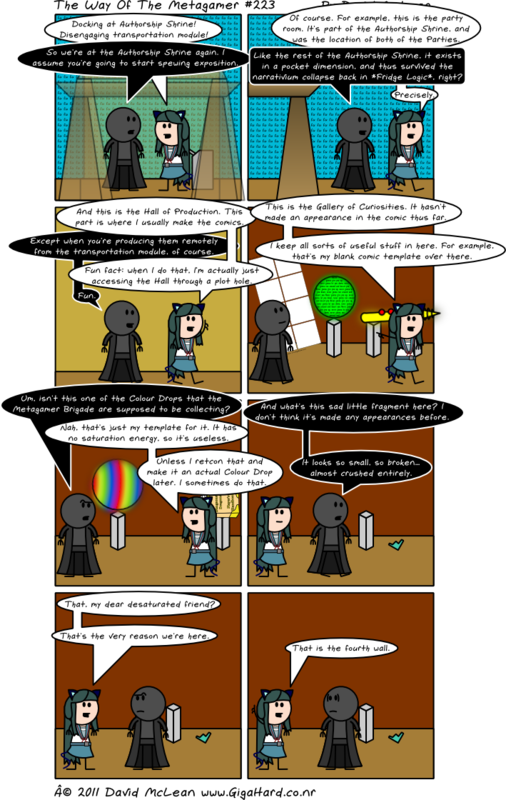 Your first complaint is asking the artist to completely change how he makes the comic, the second isn't even really valid anymore since the closest thing there's been to a mention of D&D since they went to the SoL is D&D spells being cast (and only one, I believe), the third is also asking to completely change the way the comic is made, and the fourth, while more reasonable then the others, is asking for a rather major change. This comic isn't your cup of tea, and that's fine, but it's not something that can be fixed. It's simply that you're not the kind of person this would appeal to. Saying that it should be pretty much completely redesigned is just not feasible, let alone reasonable. Uninformed, as the person said they just skipped ahead. Now, I will say that for me personally this strip was lack-lustre as a "DnD" comic. As the horribly bizzare thing it became, I f'n -love- it. The Author: Docking at Authorship Shrine! Disengaging transportation module! Xavius: So we're at the Authorship Shrine again. I assume you're going to start spewing exposition. The Author: Of course. For example, this is the party room. It's part of the Authorship Shrine, and was the location of both of the Parties. Xavius: Like the rest of the Authorship Shrine, it exists in a pocket dimension, and thus survived the narrativium collapse back in *Fridge Logic*, right? The Author: And this is the Hall of Production. This part is where I usually make the comics. Xavius: Except when you're producing them remotely from the transportation module, of course. The Author: Fun fact: when I do that, I'm actually just accessing the Hall through a plot hole. The Author: This is the Gallery of Curiosities. It hasn't made an appearance in the comic thus far. I keep all sorts of useful stuff in here. For example, that's my blank comic template over there. Xavius: Um, isn't this one of the Colour Drops that the Metagamer Brigade are supposed to be collecting? The Author: Nah, that's just my template for it. It has no saturation energy, so it's useless. Unless I retcon that and make it an actual Colour Drop later. I sometimes do that. Xavius: And what's this sad little fragment here? I don't think it's made any appearances before. It looks so small, so broken… almost crushed entirely. The Author: That, my dear desaturated friend? That's the very reason we're here. The Author: That is the fourth wall.